Alex meets me in the lobby of my hotel. He’s a young Greek guy about the same age as me. Instantly I decide I like him. Alex is going to be my friend for the day, I think to myself. 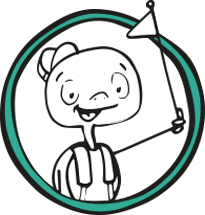 Alex is an archaeologist by training and, until recently, by profession. The economic situation in Greece meant he lost his job last year and has been unemployed ever since. It’s why he’s able to come and meet me on a weekday. 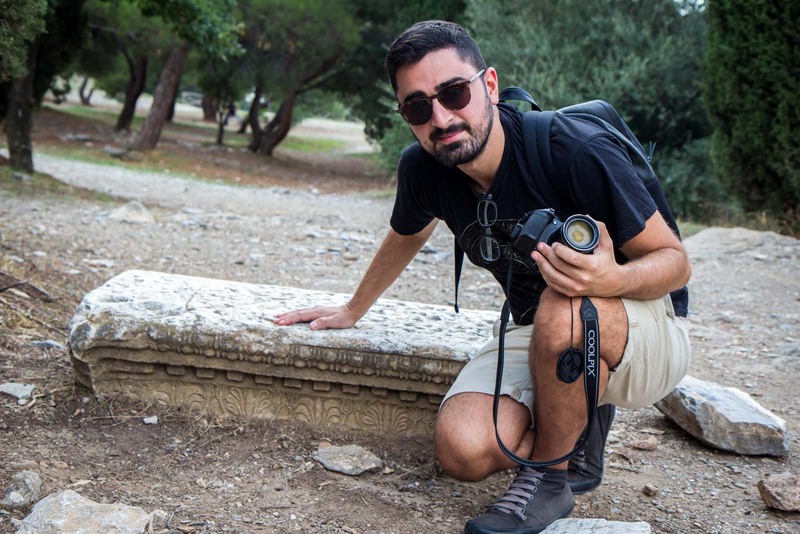 He’s one of the official volunteer tour guides of Athens – part of a program called ‘This is My Athens’. Alex and the others give up their time for free to take visitors around the city and show them some of the things you might not normally see on one of the bigger packaged tours. It’s personal, it’s flexible and – best of all – it’s friendly. We start walking down the street from my hotel and I ask if Alex has anything in particular in mind to show me. He’s got some ideas but no firm itinerary. He wants to hear about what I’m interested in and what I might have seen already. 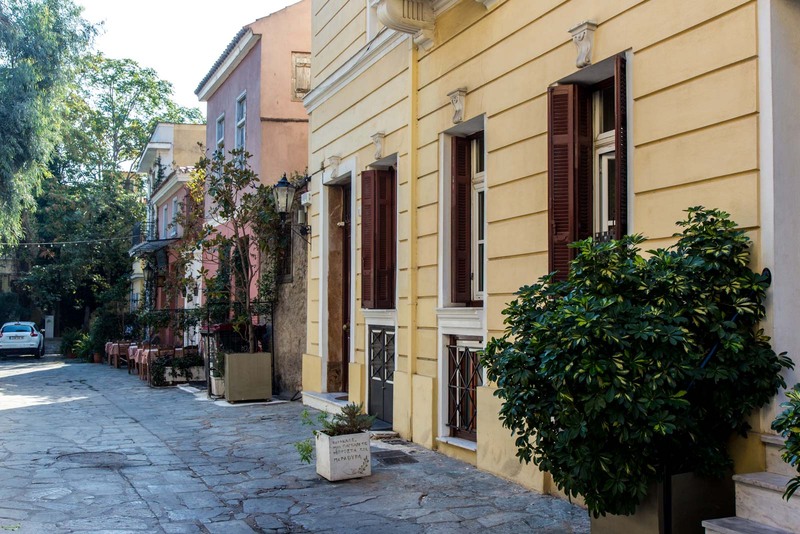 We decide to begin by going for a bit of a walk around the Plaka area – where some of the oldest houses of modern Athens were built in the 1800s. We try to go to a small gallery with no obvious signage (in English) but it seems to be closed. I mentally note where it is to come back another time. So we end up at the Museum of Greek Folk Musical Instruments. It sounds like an odd place to go but it’s small, it’s free, and it is inside one of the original family homes of the area. Although the musical instruments on display are interesting, I feel like we’re here to look at the building more than the exhibits. I certainly wouldn’t have known to come here on my own. As we continue to walk, Alex tells me about Greek history – the ancient kind. About the Mycenaean Empire and the arrival of the Ancient Greek civilisation, through to the Byzantine period and the effects of the Ottoman Empire. He knows his stuff and it’s impressive. Not only is Alex clearly an extremely well informed archaeologist, he also has a wonderful way of explaining things and telling stories. We walk through the streets of Athens and he points out landmarks or details in a building – the features of the Roman Forum, the markings on the streets that denote the route of ancient roads, or even the design of a ceiling that we spot through the open window of someone’s house. This is not just random ambling – Alex has a destination in mind – and it’s not long until we arrive at the Kerameikos Cemetery. 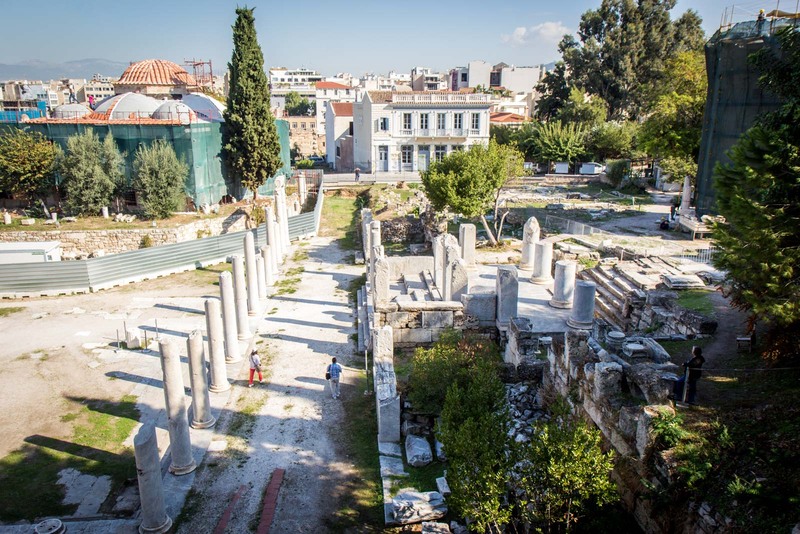 Although this is one of the most interesting archaeological sites in central Athens, it is often overlooked by visitors. This, Alex tells me, is why he’s decided to bring me here. 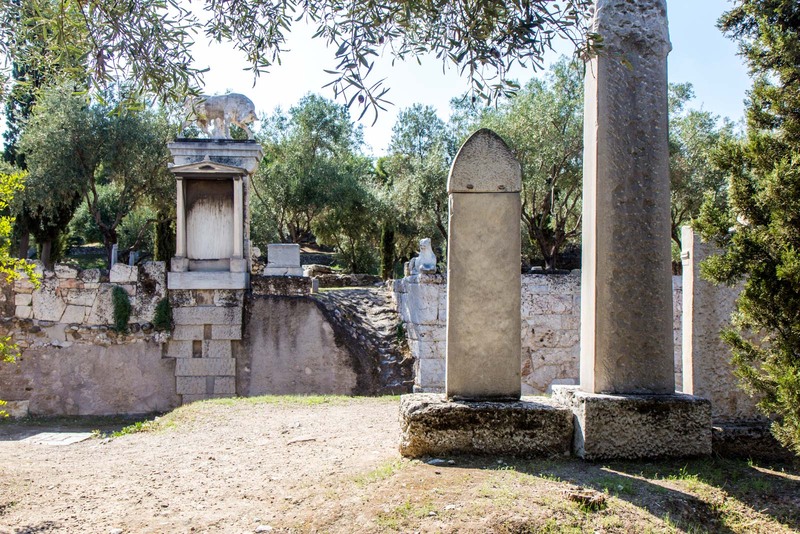 Kerameikos Cemetery has about 1000 tombs from the 4th and 5th centuries BC. It was constructed on the edge of the old city wall, just outside the entrance, and was the burial ground for citizens of all classes. What is so fascinating about the site is the tombstones – each a piece of art in its own right. The carved stones depict scenes of families bidding farewell to loved ones or scenes of their lives that represent who they were. The graves are set in a green park of olive trees and it feels like a sanctuary from the busy concrete city, a true resting place. After exploring for a little while, we set off again. I’m not quite sure exactly when it happens but at some point I realise we have completely stopped talking about history or about landmarks… and now we’re talking about ourselves. I knew Alex was going to be my friend today! The conversations turns to the current economic issues in Greece and how that’s affected people like Alex. He’s lost his job – but there’s more to it than that. It’s changed the dynamic of the society to a certain extent. There might be work elsewhere in Europe (or further afield) but Alex doesn’t want to leave Athens – even though a third of his friends have. 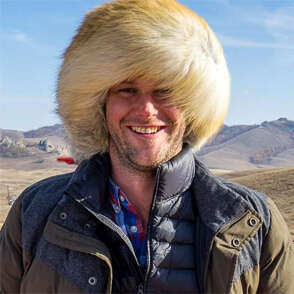 He has too strong a connection to the city. Alex tells me he does these tours because he wants to feel productive and like he’s making the most of his spare time. But he also enjoys meeting new people, he says. It’s not about being a ‘tour guide’, as such. He often spends a lot of the time letting his guests talk, listening to them and learning more about their lives. It goes both ways. Once we’ve seen a few more things in the area around Kerameikos, Alex offers to drive me in his car to one of his favourite spots in Athens. I can hardly turn down an offer like that, can I? So we head off in his car towards the suburbs, past a university campus, and up into one of the hills. Mount Hymettus, to be exact. 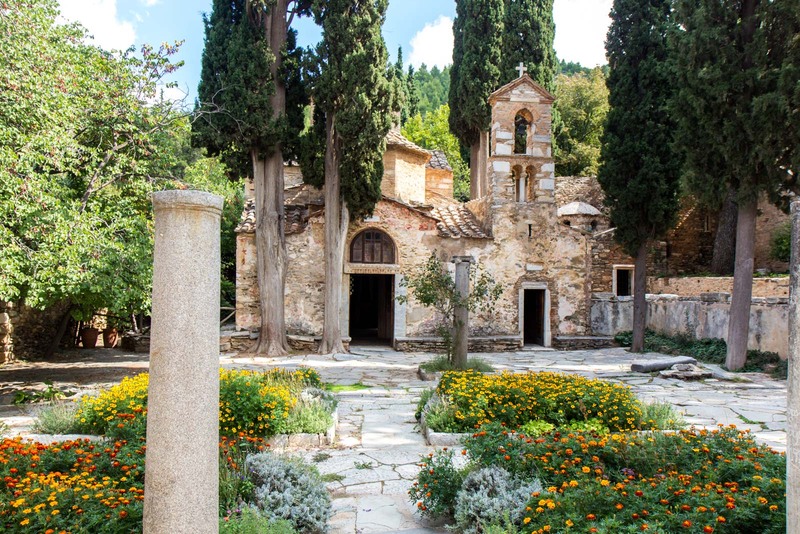 The highlight here from the perspective of a student of history is the Kaisariani Monastery, a Byzantine complex established in the 10th century. The original church from this period is still accessible and some of the frescoes are in an excellent condition. This Eastern Orthodox monastery is an important part of the story of Athens which, of course, did not stop after the Classical Period. A trip up to Mount Hymettus is not just about the monastery, though. Alex tells me that he often comes up here with his friends for picnics or for a walk through the forests. There are excellent views out across the city of Athens beneath us and leisurely dirt tracks that roll along the hillsides with small archaeological sites to discover. I know this isn’t the kind of place that I would ever have come on my own. Firstly, I had never heard of it before. Secondly, I wouldn’t have known how to get here if Alex hadn’t brought me in his car. It would be easy enough to have got a taxi perhaps but it’s not particularly accessible to the average tourist. This is HIS Athens and now it’s slowly becoming MY Athens. It’s the beauty of this volunteer tour program. Not only are you able to spend some time with a local and hear their stories of the city, they are able to show you some of these spots that you would never have seen otherwise. This is not some kind of ‘free walking tour’ gimmick. It’s a genuine immersive experience into the local side of Athens and it’s so heartwarming to meet the locals who are willing to do this because of a combination of a love for their city and a desire to help visitors see some of its virtues for themselves. For accommodation in Athens, I suggest the Electra Palace Hotel. Time Travel Turtle was supported by the Athens Convention and Visitors Bureau but the opinions, over-written descriptions and bad jokes are his own. This would’ve been such a great tour to do during my time in Athens! It’s always good to get some insider information to find the best places in a city. That monastery looks gorgeous. The paintings looks beautifully intact! I feel like I missed out, I will do a tour like this next time I visit the city. Great to hear. I think everyone should give it a try. It is a really cool way to see a different side of the city. This is fantastic and it also a great concept of discovering a city by its locals. I love the idea and this way you get to know them and get their insider tips for anyone visiting the city. Yeah, a fantastic concept. And it’s so encouraging to see that there are locals who are willing to do this. I wonder how many other cities in the world would be able to find people who would offer their time like this for international visitors. This sounds like an amazing experience and a great way to tour any city. This kind of intimate tour benefits both the tourist and the tour guide, who both connect to the city and new people in a new way. The Kaisariani Monastery is such a beautiful example of Greek culture in Athens. Yeah, the monastery is beautiful and I would never have known about it if I hadn’t had a local guide to show me around. The fact that these tours are also free and are done by people who are passionate about their city also adds a lot to the experience! I did this same tour in Athens with Alex as well. Just amazing, we did a complete different itinerary and learned so much and had a great time. One of the highlights of all of my travels. I recommend this tour to the highest degree. Thanks for the comment, Christian. I’m so pleased to hear it wasn’t just me who has been impressed by Alex. He gave a fantastic tour and it sounds like that’s the case every time. How much tip would be appropriate for this type of tour. Hi Linda. If you use the link in the story to head to the This is My Athens webpage, someone there should be able to help you. Have a great trip!